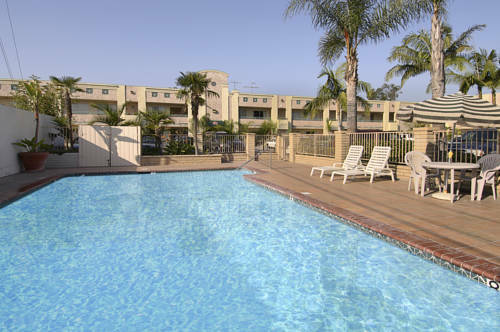 Conveniently located off Interstate 5 in the heart of Anaheim, this Ramada Anaheim Maingate North is near Disneyland Park, Disney's California Adventure Parks, Knott's Berry Farm, Knott's Soak City Waterpark, the Anaheim Convention Center, concerts at the Honda Center, Angels Stadium, and many local restaurants. Relax at this smoke-free hotel with complimentary continental breakfast, complimentary wireless Internet, outdoor pool, and business center with printing services. Shuttle service to Disneyland and airports is available. Guest room amenities include desk and TV and some rooms feature a microwave and refrigerator. Suites and handicapped accessible rooms are also available. Free parking for one car per room. There is no charge for children 17 and under when staying with an adult. Programmatic architecture gives us the munchies. Queue up for coffee and pastry in a tunnel between two chocolate doughnuts. An enchanting giant doughnut in Compton, and example of yummy programmatic architecture.